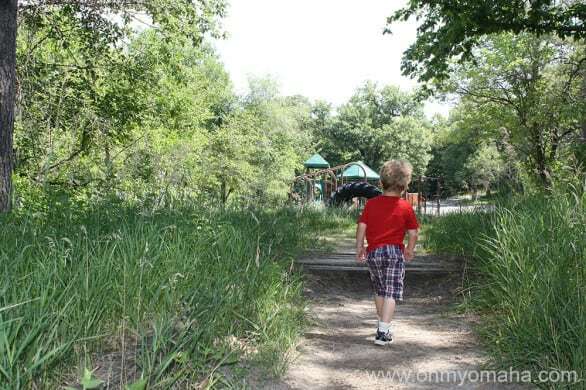 It’s prime season to visit Hitchcock Nature Center in Honey Creek, Iowa. The nature preserve, about 20 minutes outside of Omaha, is a hawk-watching haven. If you visit September through December, you’ll likely find a volunteer at the top of the nature center’s tower, binoculars trained at the sky, counting how many feathered creatures pass over the park. Here’s a link to a great site with all the migrating raptors you can look for. I’ll be honest, bird watching’s not my thing. I’ll look up and appreciate a giant hawk like everyone else, but I can’t tell you what kind it is, what it’s hunting for and where it’s headed. But, the volunteer probably could. When my family goes to Hitchcock this time of year, we go for a good hike in cooler temperatures. It’s one of my 7 Favorite Trails Near Omaha. We’ve been bringing the kids here for a few years. Most trails are kid-friendly. The few difficult passes are short, though I still recommend sticking to easy and moderate paths. This September, we hiked to a lake within the park for the first time. 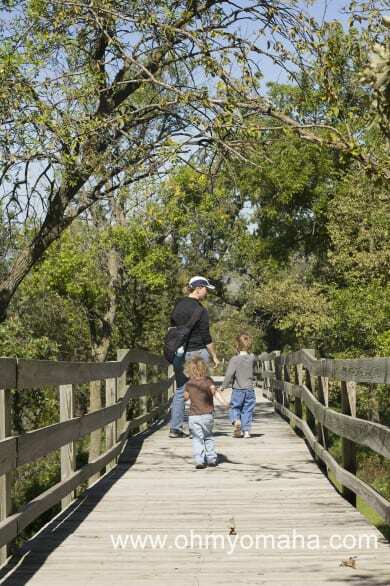 One trail to it starts as a boardwalk, providing wheelchair access into a beautiful part of the Loess Hills. Our most recent visit to Hitchcock led to “discovering” this boardwalk. 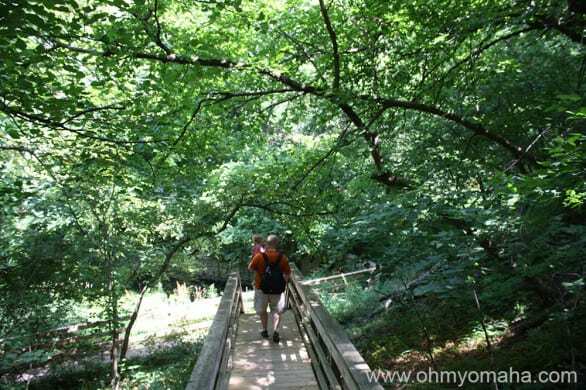 It makes nature accessible for a lot of people! 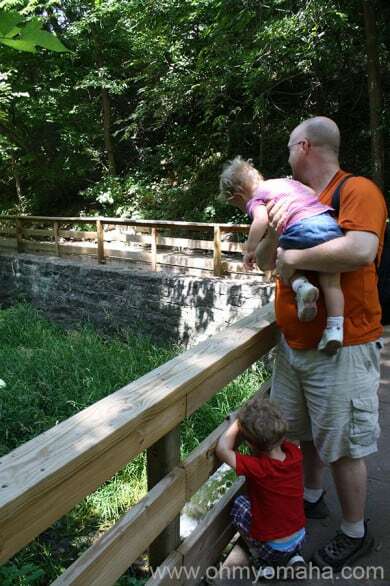 We decided we’ll try to walk every foot of the trails with the kids – we’re sure to discover new things each visit. 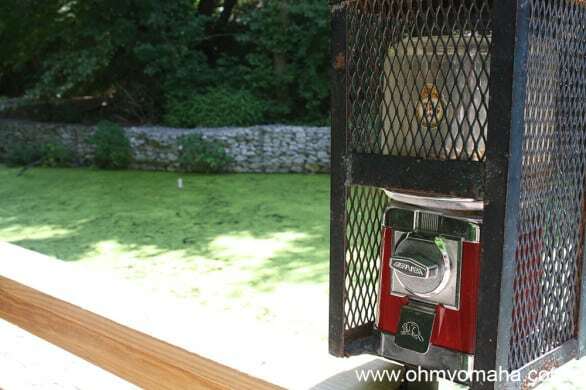 Before you hike Hitchcock for the first time, stop by the visitors center. 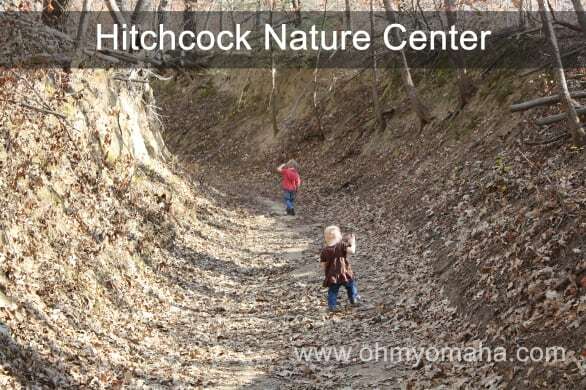 Your kids will find a lot to activity areas to explore and learn about the animals and flora found at Hitchcock and in the Loess Hills. Hitchcock Nature Center has an annual Halloween event for kids! Get the details on the 2017 event, as well as other Iowa and Nebraska parks here! 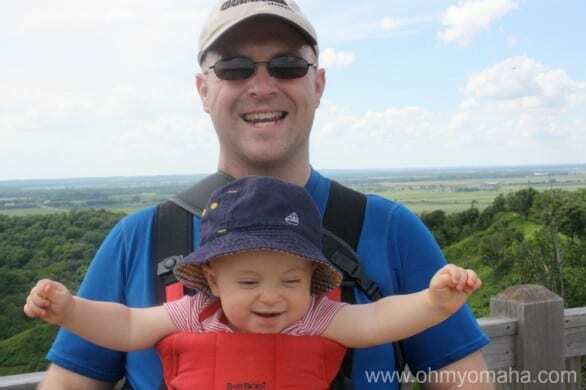 You can check out a backpack full of things your kids will like to use on your hike. In one we checked out, there were things like a magnifying glass and ID cards for birds. It’s FREE to check out for the day, too. A young Farley checking out the contents of the backpack we checked out from the visitor’s center at Hitchcock. I might have overdone it this summer bringing my family to so many events that were packed with people. 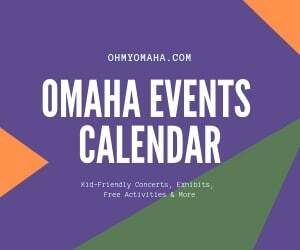 It’s easy to find something that’s free and family-friendly every weekend in Omaha, but you have to keep in mind that 5,000 of your neighbors are headed there too. We had to get out of town and get some fresh air recently. Here’s Mr. Wonderful carrying Her Royal Highness, Mooch, at Schramm. So, recently, my family decided to get out of Dodge, so to speak. Just for a few hours. 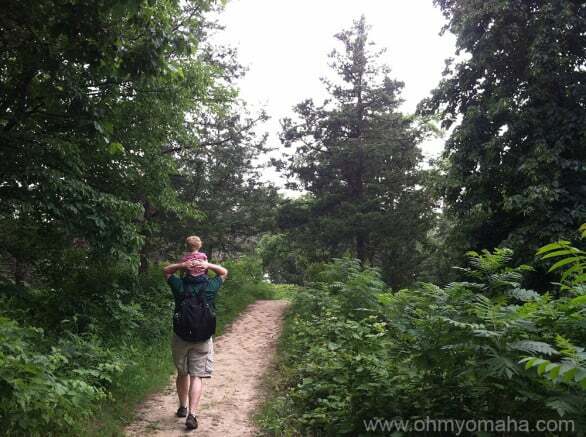 One Saturday we ventured to a family-favorite, Hitchcock Nature Center in Honey Creek, Iowa. It’s about a 20-minute drive northeast of Omaha. 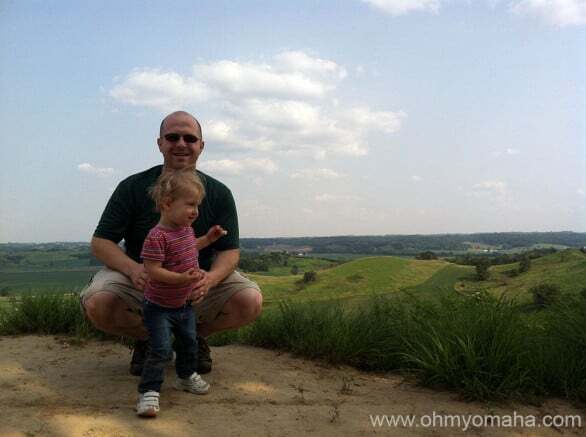 Another weekend, we visited Schramm Park State Recreation Area, which is about 6 miles south of west Omaha. It had been a very long time since our last visit. Our visits couldn’t be more different. I could go on a rant about how funding makes all the difference (Hitchcock wins), but I’ll just try to focus on what we liked at each. The view from one of Hitchcock’s trails. We visit here most seasons, it’s so easy to get to. What’s to love about this place? A lot. The visitor’s center is a great place to start off your visit. There are interactive displays that my children love, from making animal footprints to touching pelts and trying to run off with stuffed animals. You can learn what animals and tracks to look for on your hikes. 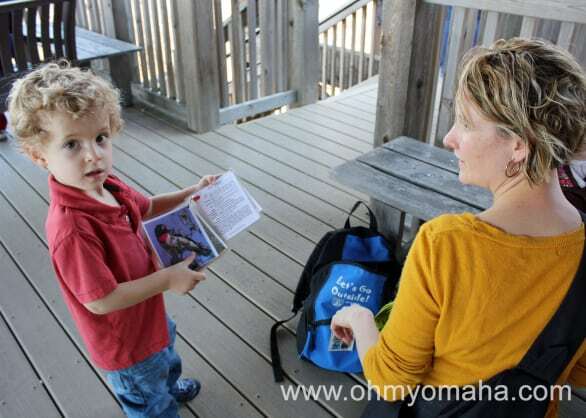 If you have youngsters, be sure to check out one of the free Adventure Packs. It’s a backpack with fun things to help your hikes, my son’s favorite was the magnifying glass. Next to the visitor’s center is a lookout tower, popular among raptor watchers (in fact, they have Hawk Watch you can take part in). Take in the view, then get on your way exploring. The trails are clearly marked with difficulty levels. Some spots along the trail will have a Trailcast sign, these are Hitchcock specific podcasts designed to enhance your visit, they change with the season). A quiet walk in the park. Even with its proximity to Omaha, Hitchcock feels like an undiscovered gem. The trails are not packed. 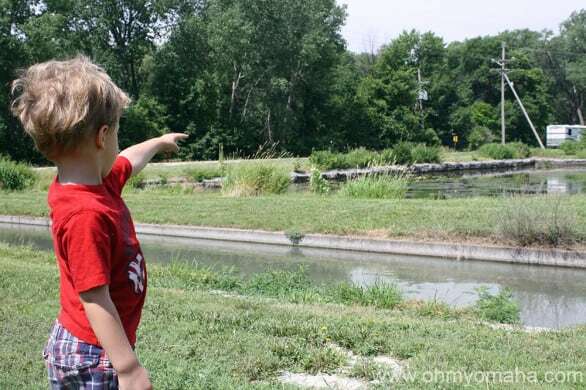 Offerings that will interest your children, besides that cool visitor’s center, include a playground, archery, geocaching and earthcaching, and an abundance of educational offerings. Camping is available, and there are a few cabins. Yes, look at this magnificence. Our trip to Schramm Park State Recreation Area was impromptu. I’d read some friends’ Facebook posts on hiking there and when the time came one weekend to decide what we should do, I remembered Schramm. I’m not too familiar with the park since it’s been a few years and given the spontaneous trip, I hadn’t looked into what we could do there. I figured we’d have a picnic and let the adventure unfold on its own. That always works out well with kids, the not-planning thing. We parked near the fish hatcheries and decided that we’d picnic before our hike. 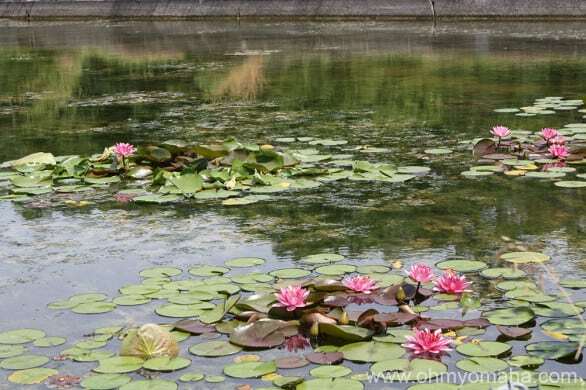 The manmade ponds weren’t necessarily the most scenic of views, but we did find beauty there. Checking out the fish hatcheries. Once filled with fuel, we set off on a hike. We passed a trailhead on our quick tour of the park in our car, but decided that from the hatcheries, we’d surely hit a trail. Not so much. 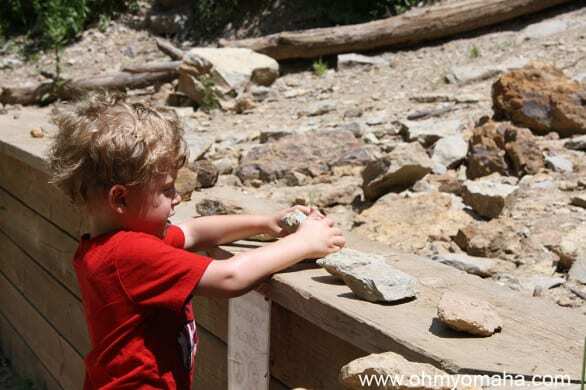 We walked a board walk along the hatcheries for a ways, quickly stumbled onto a playground (that was too hot to play on that day), and then continued trying to locate a trailhead. Farley finds the park, with playground equipment surfaces slightly cooler than the surface of the sun. Gotta love Nebraska summers. We should’ve just packed the kids back in the car and drove to the trailhead we knew existed, but Mooch has been putting up epic fights whenever I have to strap her into her carseat and I just wasn’t up for that. Exploring rocks at the Geological Display at Schramm. So we gave up the search and walked down the road to take in the view of the Platte River. On the way, we stopped at the Geological Display. Amazing how excited a kid can get about a big rock. I guess if you put a big rock on a ring and women sometimes gets that way. Farley liked this area of the park the most, I think, even if there wasn’t much to it. 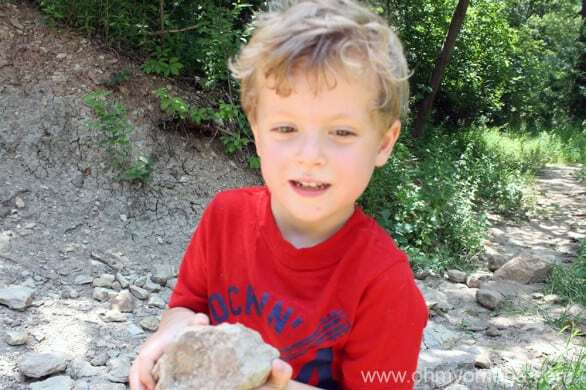 We spotted some fossils in the rocks and picked up some trash, then continued on to the river. The Platte is a very sandy, shallow river and people were wading out into it that day, but one we weren’t about to venture into just yet. The view is nice, though, so I’m glad we took a minute to check it out. 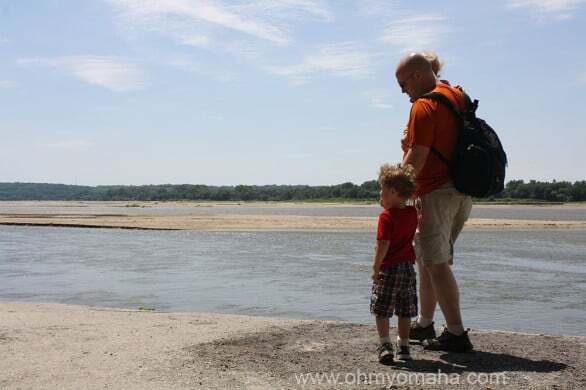 Checking out the Platte River. Schramm is known for its Ak-Sar-Ben Aquarium, which we didn’t visit (Right after our visit, it was announced that admission was now free). I think there must be another entrance to Schramm, another section of the park, that we missed. Where we were, all we saw was the closed museum that was once the state’s first fish hatchery in 1882. I have this suspicion that there is a “New Schramm Park” out there that my friends all love. 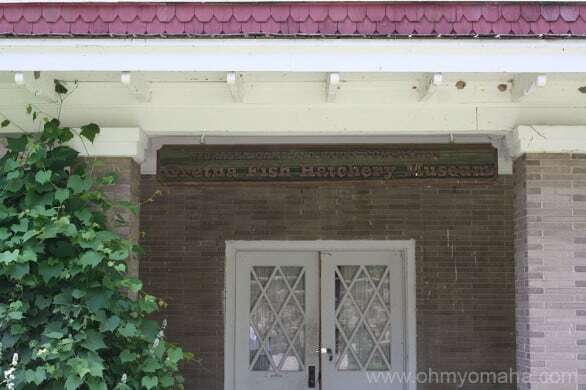 The closed Gretna Fish Hatchery Museum. There were many visitors at Schramm on the day we visited, proving it is a destination. 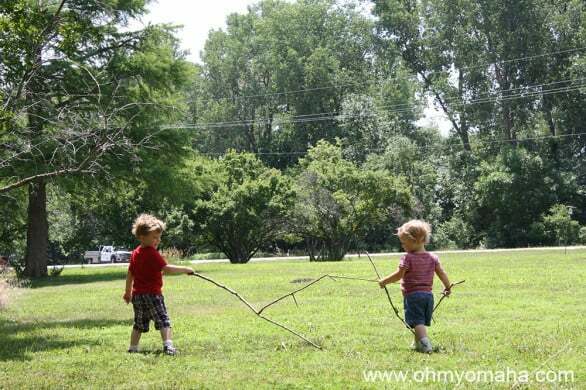 My kids ultimately ended up getting the most joy picking up sticks and driving me insane by running around with the biggest, pointiest ones they could find. A favorite pasttime of my kids’: Running with big sticks. I guess you don’t need modern facilities to capture a child’s imagination. Still, I’d love to see this park get some TLC. 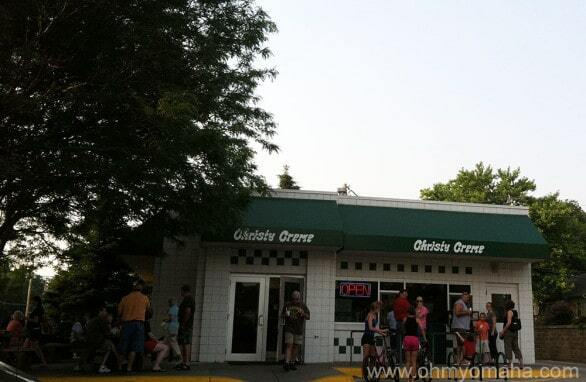 Christy Creme, a Council Bluffs tradition. We stopped for ice cream after visiting each of these parks. 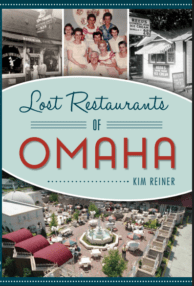 After a visit to Hitchcock, we like to drive south on Old Lincoln Highway, where you’ll come across a Council Bluffs’ favorite, Christy Cream, on the north end of Council Bluffs. They’re known for the special sherbet flavor of the day, but I’m a chocolate kind of girl. After Schramm, we went into nearby Louisville, Neb. Head down the main street and you’ll find two ice cream options. Every stinking time we go to Louisville, I’m determined to check out the old fashion soda fountain at Blake’s Pharmacy, and every time it’s closed (Sundays, man). This trip, we all enjoyed cheap twist cones at Dari Crème.